Soon after he first settled in Pune and a community of seekers had begun to gather around him, Osho began to integrate new Western therapeutic approaches into his work. Known broadly as “Humanistic Psychology Movement” these methods had evolved in the West as a response to the limitations of Freudian “talk therapy” and B. F. Skinner’s behaviorism. Osho combined a wide variety of these therapy groups and processes, as stepping stones, with his revolutionary “active meditation techniques,” which soon earned the community a reputation as “the world’s finest growth and therapy center.” It attracted those in search of personal transformation, some of the most innovative therapists and bodyworkers in the West, and people interested in meditation. Osho worked closely with both therapists and group participants to ensure that these offerings were in tune with his vision of a psychology that aims not to restore people to the functional neurosis society defines as “normal,” but to open the doors to a radical transformation of consciousness. 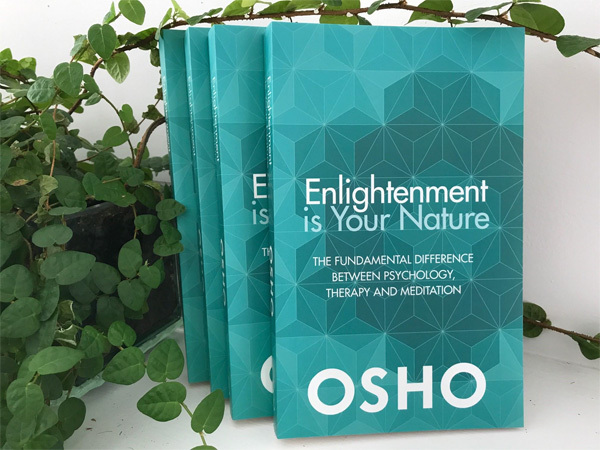 This book, Enlightenment is Your Nature, lays out Osho’s approach as he explains that therapy is used only as a cleansing process, that it is only a preparation for meditation. In his vision, therapy has a different function from that used in the “outside world” where therapists and counselors try to bring the person back into the mind so they can function efficiently in society. Instead, Osho uses therapy only to prepare the ground, cleaning out the weeds of neurosis in order to plant the flowers of meditation. Rather than trying to “fix” the neurotic mind, the person is supported to be courageous enough to take a step beyond the mind – and that happens through meditation. Osho has often characterized this approach as the Psychology of the Buddhas. This approach understands the need to cut the very roots that create and feed our neuroses and psychoses, as the fragmented “personality” pulls us in opposing directions in a constant battleground of our “shoulds” versus our “wants,” our desires versus our genuine needs, our ambitions of the mind versus the longings of our heart. Where psychoanalysis takes years in trying to renovate the old structure, analyzing the past and dissecting the imprints it has inflicted, patching it up here and there, the psychology of the buddhas does not work within the mind at all. It has no interest in analyzing or synthesizing. It simply opens the door to being able to get out of the mind, to find the “switch” that allows us to step aside from it – to turn off all its chatter and worries and problems and plans, and just be. It is not against the mind, either. It recognizes the mind as a useful tool in navigating through everyday life and many of its everyday challenges. But meditation is the key to being able to use the tool of the mind as a servant, rather than being a slave to all its moods and “problems” and tensions. Meditation is, according to Osho, a process of dropping from the outside into the inside, forgetting the world of objects, the world of thoughts, the world of feelings – and a moment comes when pure consciousness is there, without any content. To know this consciousness is to understand what the psychology of the buddhas is, to rest in the fullness of the inner being. That inner being knows no pathology, no neurosis, no fears no anxiety. And that natural state of our beings, Osho describes as enlightenment. In Enlightenment is Your Nature Osho deconstructs all misunderstandings of what enlightenment is, and offers a view freed from all spiritual and religious beliefs – including the distortions of asceticism and renunciation that have arisen in Eastern and Western cultures both. Taking the reader step by step through the history of how both East and West have approached the mysteries of the human mind and spirituality, he offers a simple science of consciousness and how it works, how we have lost contact with it, how consciousness is related to the mind and the brain. In very clear and scientific terms he shows how one can, through awareness and taking full responsibility for one’s life, go beyond all the belief systems, habits, and superstitions that keep us tethered. That process of awareness and understanding, he says, brings us back to our nature – and that is enlightenment. “Buddha never needed any psychotherapy for his sannyasins; those people were innocent. But in these twenty-five centuries, people have lost their innocence, they have become too knowledgeable. People have lost their contact with existence. They have become uprooted. “I am the first person who uses therapy, but whose interest is not therapy but meditation, just as it was with Chuang Tzu or Gautam Buddha. They never used therapy because there was no need. People were simply ready, and you could bring the rosebushes without clearing the ground. The ground was already clear. “In these twenty-five centuries man has become so burdened with rubbish, so many wild weeds have grown in his being that I am using therapy just to clean the ground, take away the wild weeds, the roots, so the difference between the ancient man and the modern man is destroyed.